Developer EKN announced that the American Legion and VFW will not be part of their new $35 million dollar hotel development on the North end of downtown. Both groups will be looking for locations outside of the downtown area. The project will feature 259 hotel rooms, built on a plot area of 29,264 square feet with 284 parking spaces and is planned to open June 2019. EKN CEO Ebby Nakhjavani said a floor had been added to the project to accommodate the veteran service clubs, so their withdrawal means re-configuring the plans. The current proposal is for a nine story building with "penthouse" for its mechanical plant. The hope is to submit the plans to the city by September with the goal of getting city council approval before the end of the year. Nakhjavani would like to break ground on the project by mid-summer next year. The city's Planning and Zoning Commission unanimously approved sending a preliminary design for a nine-story hotel with 175 rooms to the Rochester City Council with its support. However, the commission opted to suggest an alternate plan be considered, rather than the main design for the corner of Civic Center Drive and First Avenue Northwest. 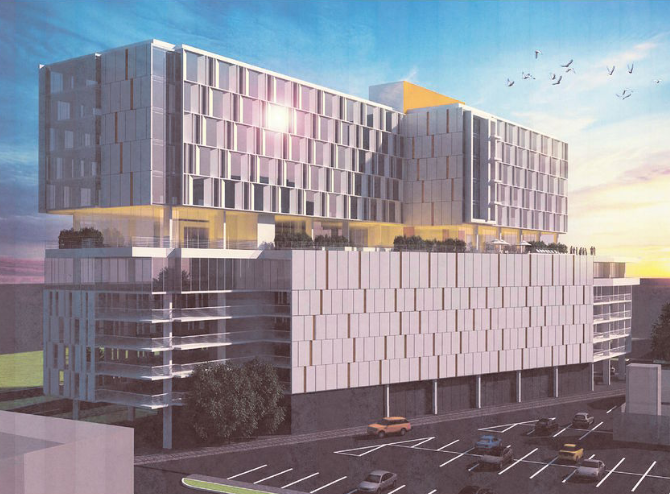 The initial design offered an access point from Civic Center Drive, which would have allowed one-way traffic under an overhang to access parking on the building's second and third floors. Additional access, as well as the only exit, would be on Second Avenue. Commission members questioned whether the route between the hotel and street was the best option. "I don't see the benefit of throwing in more roads and eliminating that space," commission member Thomas Hill said. 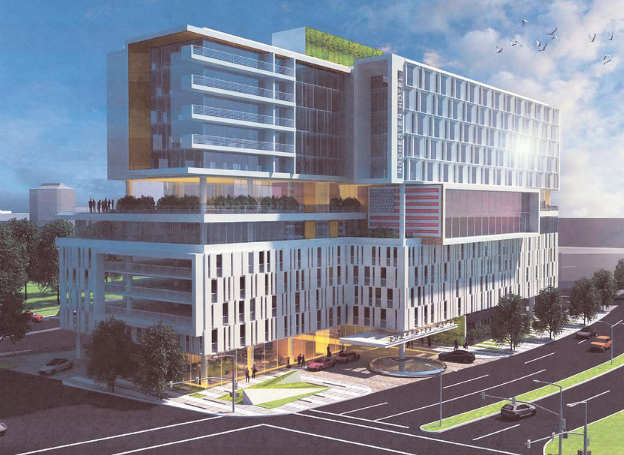 The project's architect, Tom Sprinkle of HKS Hospitality Group, based in San Francisco, said the alternative, which would create a drop-off point along Civic Center Drive, could allow the hotel and potential restaurant to be built closer to the sidewalk to better meet Destination Medical Center design guidelines. I think it will be easier to have all of the EKN Development projects under one thread. There are several updates regarding the Holiday Inn and St. Mary's hotel. The EKN Development Group announced Wednesday that it is buying the 173-room Holiday Inn hotel at 220 South Broadway. Once the extensive conversion is completed, the brand will change to Hotel Indigo. Nakhjavani hopes to be able start construction this summer. After an estimated eight to 12 months, the hope is to have the makeover complete by the first quarter of 2019. The purchase includes only the hotel portion of the 16-story building, floors second through eight. On the street level of the hotel are separately owned business condos occupied by the Rochester Area Chamber of Commerce and the Smith Schafer & Associates accounting firm. Floors nine through 16 are residential condominiums with many individual owners. 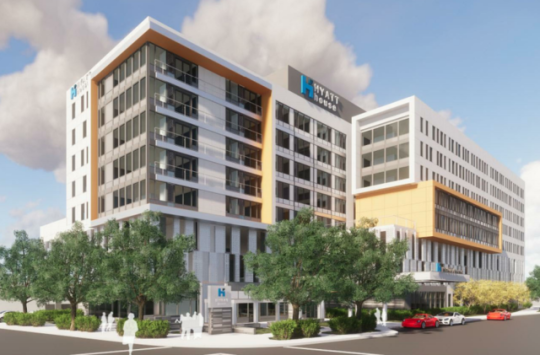 EKN is also planning to eventually build an extended-stay hotel at 1102 Second St. SW. That’s the site of Virgil’s Auto Clinic & Towing, across from Saint Marys Hospital. Virgil’s recently removed their underground fuel tanks and stopped selling gasoline, which will make the transition easier. EKN’s goal is start work on that site by the end of 2018. Article also mentioned they will hold a meeting with the neighborhood group sometime in early April for the St. Mary's hotel. I think this project would also include condos. Between these three projects, EKN is pumping a lot of money into Rochester. They must be confident in the market. EKN won final approval for its plan to build an 8-story Hyatt House hotel on the north end of downtown. The building was originally proposed as 12 stories, but has been losing floor count with each new presentation. Either way it is a much needed addition to that area. Ground breaking should be happening within a few weeks according to the developer. Additionally, EKN has begun exterior work on the Holiday Inn downtown. Groundbreaking took place on April 11th for the Civic on First hotel. Expected completion is Summer 2020. In other EKN news, the hotel near St Mary's will be going before Planning and Zoning on the 24th. That 2nd St SW frontage looks rather inactivated given it's 4000 sf of retail right on the corner. Hope they break it into multiple storefronts. Put a door on the corner and/or on the 11th Av SW frontage to break things up a little bit. Additionally, since they're rebuilding the curb, there's no need for the right turn lane southbound on 11th approaching 2nd St... could easily cut in another 4'+ of amenity zone for that sidewalk. Otherwise, looks like a good project.